Life for a narcissist really is all about them. While most of us have some narcissistic traits, the true narcissist is so damaged that they can't see things from anyone else's perspective but their own. So how can you know if the person you're dating is actually a grade A narcissist? The relationship is likely to be very intense early on. They may take you to expensive places, shower you with gifts and attention, make extravagant promises about what they can do to help you and generally make you feel like a queen. But beware: It is not what it seems and in fact a carefully staged performance designed to woo you. Sadly, this isn't about you—the narcissist is fond of making grand gestures because they love the idea of being seen to be generous. A little further down the line they'll remind you saying, "I've done so much for you, you're so ungrateful!" The narcissist is, without fail, extremely charming and charismatic. You will feel irresistibly drawn to them—you might even think you've met your soulmate. They'll shower you with compliments and might say they're in love with you very soon. But it isn’t what it seems. When they say, "I love you" they mean that they love the way they feel when they see themselves through your admiring eyes. They love the power they have to manipulate your feelings. A narcissist will convince you that they're wealthy and have an amazing job. They'll tell you about their famous or powerful contacts. Quite often though, these things just don't add up—for example, you may find that, in spite of their affluence, they're living in a shabby one bedroomed flat in a run-down area. If you question them about it though, they'll come up with a convincing reason. The narcissist suffers from delusions of grandeur and is usually a pathological liar. Sometimes, they even start to believe their own lies. Narcissists, in spite of all outward appearances, don't like themselves. When they look in the mirror, or more accurately look inside themselves, they don't like what they see. In fact they find it so unacceptable that they invent a different self, a false persona who is the person they wish they were. They re-invent their past and will ply you with stories of tragedy, or tales of a perfect, fairy tale upbringing. 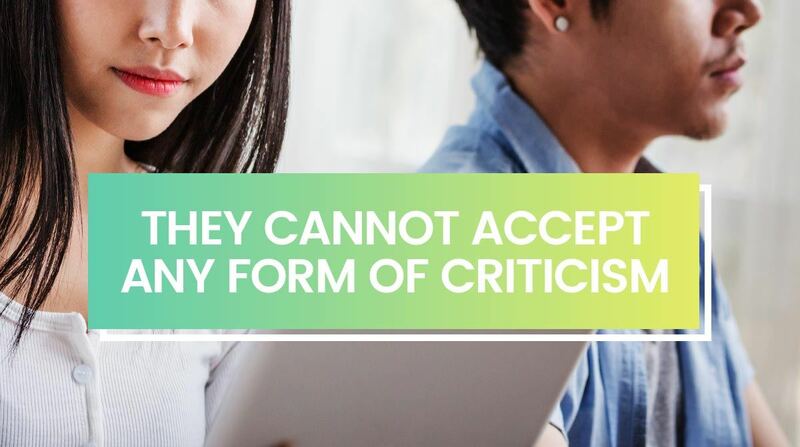 While the narcissist has no problem dishing out complaints—in fact they seem to find fault with most people, they are hyper-sensitive to criticism themselves. Even the mildest of suggestions that they've made a mistake or have flaws is likely to result in a range of adverse reactions. They may explode in fury, or alternatively withdraw and become sulky and silent. Most narcissists are very adept at turning the criticism around and blaming you. This can be so subtle that you don't realize it's happening and may well find yourself apologizing. It is only afterwards that you wonder to yourself how that came about. The narcissist will take disagreement very personally, as a form of criticism. They may become angry, or simply refuse to engage in the discussion saying something like, "Well we'll just have to agree to disagree!" This leaves you feeling increasingly frustrated as you can never drive a point home, or even get your view heard. This happens subtly. You probably won't notice straight away, but after a month or two together you may start to wonder why you always go to their choice of restaurant, never yours. Even on your birthday they'll take you somewhere that they have always wanted to go to. It won't be long before this person starts to find fault with you. They'll blame you for everything that goes wrong, big or small. You will find yourself apologizing more and more for things that aren't your fault. In short, RUN FOR COVER! This is a tough one, but narcissists rarely change. The only real possibility of this happening is for them to recognize that they have a problem and seek therapy, which is rare. Most therapists won't take on a narcissist because they tend to be resistant to change, to look down on the therapist and try to manipulate them. However, all is not lost: If you believe you are in any type of damaging relationship, seek professional help. An experienced therapist can assist you in identifying unhelpful patterns, and suggest ways of avoiding such unhealthy entanglements in the future.